Radio wave circulator developed by researchers at the Cockrell School of Engineering. The new circulator has the potential to double the useful bandwidth in wireless communications by enabling full-duplex functionality, meaning devices can transmit and receive signals on the same frequency band at the same time. The key innovation is the creation of a magnetic-free radio wave circulator. Since the advent of wireless technology 60 years ago, magnetic-based circulators have been in principle able to provide two-way communications on the same frequency channel, but they are not widely adopted because of the large size, weight and cost associated with using magnets and magnetic materials. Freed from a reliance on magnetic effects, the new circulator has a much smaller footprint while also using less expensive and more common materials. 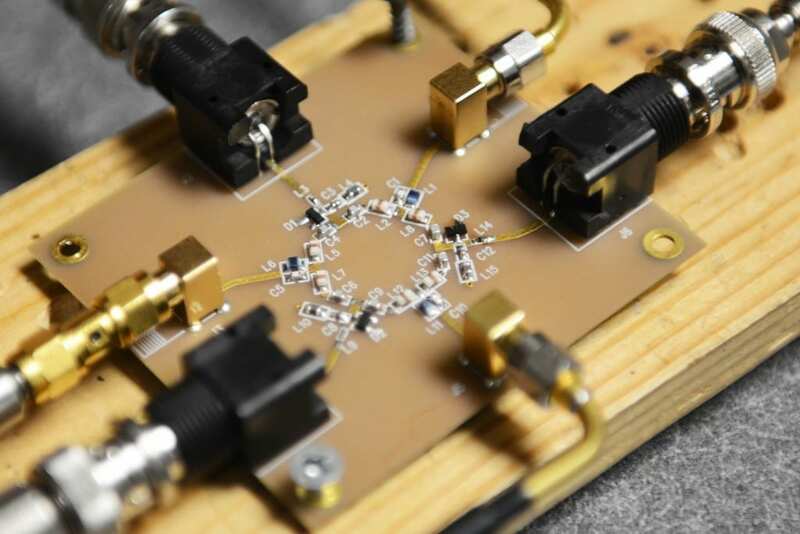 These cost and size efficiencies could lead to the integration of circulators within cellphones and other microelectronic systems, resulting in substantially faster downloads, fewer dropped calls and significantly clearer communications. The team of researchers, led by Associate Professor Andrea Alu, has developed a prototype circulator that is 2 centimeters in size — more than 75 times smaller than the wavelength of operation. The circulator may be further scaled down to as small as a few microns, according to the researchers. The design is based on materials widely used in integrated circuits such as gold, copper and silicon, making it easier to integrate in the circuit boards of modern communication devices. “We are changing the paradigm with which isolation and two-way transmission on the same frequency channel can be achieved. We have built a circulator that does not need magnets or magnetic materials,” Alu said. The researchers’ device works by mimicking the way magnetic materials break the symmetry in wave transmission between two points in space, a critical function that allows magnetic circulators to selectively route radio waves. With the new circulator, the researchers accomplish the same effect, but they replaced the magnetic bias with a traveling wave spinning around the device. Another unique feature is that the new circulator can be tuned in real time over a broad range of frequencies, a major advantage over conventional circulators. For telecommunications companies, which pay for licenses to use frequencies allotted by the U.S. Federal Communications Commission, a more efficient use of the limited available bandwidth means significant cost advantages. Additionally, because the design of the circulator is scalable and capable of circuit integration, it can potentially be placed in wireless devices. “We envision micron-sized circulators embedded in cellphone technology. When you consider cellphone traffic during high demand events such as a football game or a concert, there are enormous implications opened by our technology, including fewer dropped calls and clearer communications,” Estep said. April 18, 2019 - Shares for another company called Zoom are flying, but some might be trading the wrong stock CNBCShares of Zoom are in high demand Thursday morning but there's one problem: It appears to be a case of mistaken identity. April 18, 2019 - Real Wireless: Tottenham Hotspur Stadium – the Best-Connected in the UK Associated PressPress release *content* from Business Wire. The AP news staff was not involved in its creation. April 18, 2019 - Flow Launches New Channel CuriosityStream: Home of Award-Winning Shows Delivering the World on Demand Associated PressPress release *content* from Business Wire. The AP news staff was not involved in its creation.